A Japanese word for "soy sauce." A salty brown Asian sauce used as a seasoning or a condiment for Asian dishes. The sauce is made from fermented soybeans, wheat, water and salt. There are two varieties, light and dark. The dark soy sauce is darker in color, thicker in consistency and sweeter in taste than the light soy sauce. The dark soy sauce is used more often in Japanese cooking. 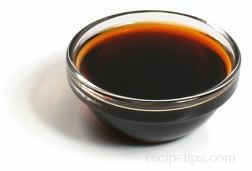 The Chinese soy sauce is generally the light soy sauce, which is lighter in color and saltier. The dark soy sauce has a longer life than the light. The light should be used shortly after opening.